We helped the Chalmers Gothenburg team with their initial steps of model building. The description below illustrates the model that was built by the Manchester iGEM team, which got the Chalmers team started. Any edits and changes beyond this were solely the work of the Chalmers Gothenburg team, such as finding of parameters for the equations. We also discussed our method of obtaining accurate descriptions of plausible parameter values for ensemble modelling, but this aspect was not incorporated in the final model, due to time constraints. The model consists of two organisms in co-culture, each dependant on one another for an essential substrate, i.e. without one the other would be unable to survive. 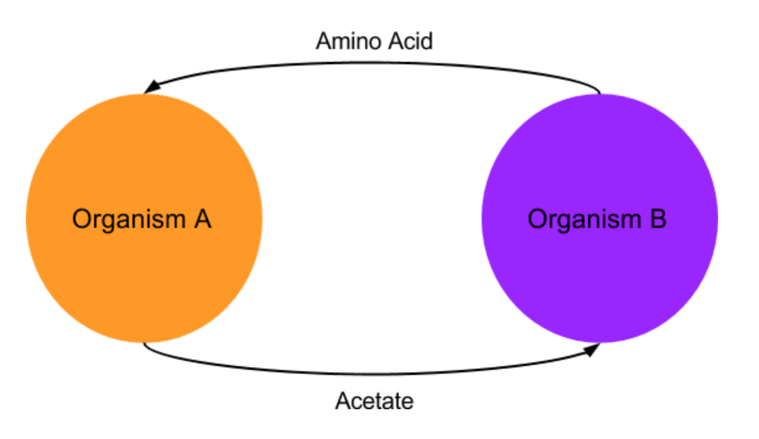 The model predicts the growth of the two organisms as well as the concentration acetate which is the main product of the system. A MATLAB script was produced to solve the system of equations. Note: each equation occurs twice, once for each cell, with cell type-specific parameter values; the equations shown are just the generic forms. Side reactions in the system were not considered at this stage. Reference: McNeil, B. and Harvey, L. (2008). Practical fermentation technology. Chichester, England: Wiley.